University of Rhode Island President David M. Dooley traveled to Ghana for a week in April 2016 to solidify relationships with Ghanaian universities and visit projects led by CRC: USAID/Ghana Sustainable Fisheries Management Project (SFMP) and USAID/West Africa Analytical Support Services and Evaluations for Sustainable Systems (ASSESS). 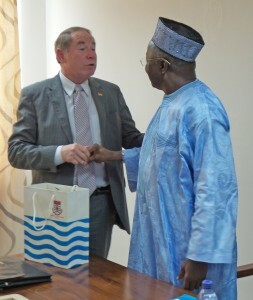 President Dooley met with University of Cape Coast (UCC) Vice-Chancellor Professor D.D. Kuupole to talk about an ongoing collaboration between the two institutions and student exchange programs and said he sees his visit as an opportunity to strengthen collaboration and friendship. He also visited Kwame Nkrumah University of Science and Technology in Ghana to discuss a partnership with that institution as well. Hundreds of people attended a public lecture by President Dooley at UCC and later witnessed the signing of a memorandum of understanding between CRC/URI and UCC’s Department of Fisheries and Aquatic Sciences and Centre for Coastal Management. During his talk, President Dooley said his vision upon assuming office as president of URI was to increase internationalization and globalization of the school and its students because the world is not just interconnected and interdependent but hyper-connected. Such hyper-connectedness includes a global economy and society in which citizens communicate in seconds and not in days or weeks. The complexity of the modern world includes great challenges, such as climate change, which is beyond one single nation’s ability to solve alone, he continued. “With these global challenges also come global opportunities. We need to focus more on the opportunities,” he told the audience. He continued: The less-developed world is not responsible for the lion’s share of atmospheric changes, but it and the entire world have to live with the consequence. That is not the only challenge with global consequences: War in one country affects the entire world; the outbreak of diseases, quality of the air we breathe, sustainability of the food supply, disputes and conflicts are all global issues, he said. “We are no longer insulated by borders and oceans as we once were, but in all this, are global opportunities and demand for higher education,” President Dooley said. During the memorandum of understanding signing ceremony, President Dooley received a gift of rich local Ghanaian kente cloth and sandals. The entire URI delegation received souvenirs from UCC as a symbol of friendship. President Dooley also met with four doctoral and two master’s students bound for URI on a USAID-funded scholarship program. The graduate students went through an intensive and competitive selection process to emerge as recipients of the scholarships. President Dooley congratulated and welcomed the students in advance to URI and hoped they make the most of the experience. Two USAID projects, USAID/Ghana Sustainable Fisheries Management Project (SFMP) and USAID/UCC Capacity Strengthening Project are collaborating in this effort. In addition, two research assistants from UCC supporting SFMP’s research and improved data quality systems activities demonstrated for the president how they collect fish stock data. President Dooley’s weeklong visit stemmed from CRC’s leadership of the sustainable fisheries management project and builds upon January 2016 and spring 2015 visits to URI by faculty and administrators from UCC. CRC has a long relationship with the Ghanaian university. URI is leading the five-year, $24 million USAID-funded SFMP, which aims to revitalize marine fisheries stocks and improve the fisheries ecosystem and livelihoods of the hundreds of thousands of people who rely on fisheries and related activities. The engagement of local universities is part of the project’s capacity building component, which seeks to strengthen the knowledge and skills of Ghanaian educators, students and practitioners so they can better manage and sustain the nation’s fisheries sector, which is vital to food security. SFMP is funded by the largest grant ever awarded to URI.